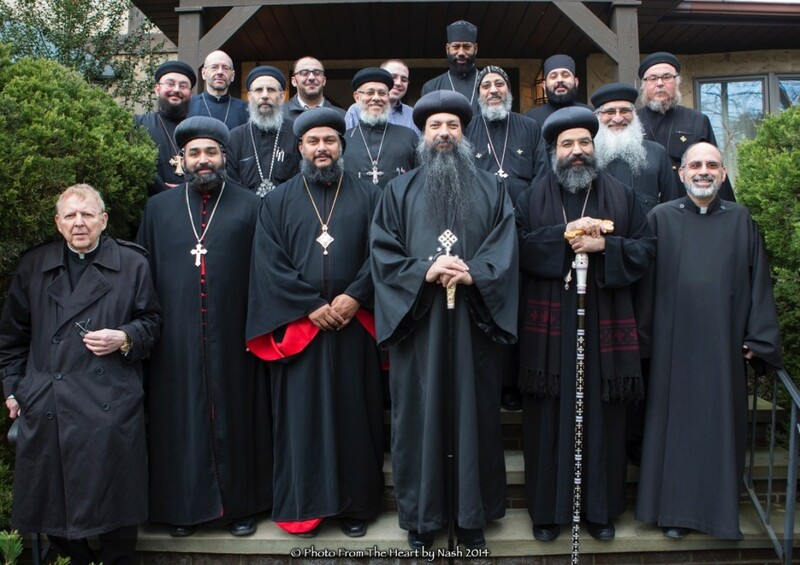 Stony Point, NY – The Standing Conference of Oriental Orthodox Churches reconvened on Monday, December 1, 2015, at the Virgin Mary & St. Pachomius Coptic Orthodox Center in Stony Point, NY where it welcomed its two newest members: H.E. Mor Silvanos Ayub, Archbishop of the Malankara-Syriac Knanaya Archdiocese of America, Canada, and Europe, and H.G. Bishop Karas, General Bishop and Patriarchal Exarch of the Coptic Orthodox Archdiocese of North America. The hierarchs were welcomed by their brothers in Christ, H.G. Bishop David of the Coptic Orthodox Diocese of New York & New England and H.E. Mor Titus Yeldho of the Malankara-Syriac Archdiocese of North America, along with the representatives of H.E. Archbishop Khajag Barsamian (of the Armenian Apostolic Church) and H.E. Archbishop Zekarias (of the Ethiopian Orthodox Tewahedo Church). H.E. Mor Silvanos tends to the spiritual needs of the Knanaya Orthodox Christians of the diaspora. The Knanaya community, an integral part of the Universal Syriac Orthodox Church, traces its origins to a group of seventy-two Orthodox Christian families, including a number of clergy, who traveled from Edessa to Kerala in the fourth century under the leadership of a merchant named Thomas of Cana. In Kerala, these migrants encountered and supplemented the indigenous Malankara Orthodox community (represented on the Standing Conference by H.E. Mor Titus) which had been established through the missionary labors of St. Thomas the Apostle among the local Brahmins and Jews some centuries earlier. H.G. Bishop Karas serves in the role formerly occupied by H.G. Bishop David before the latter’s ascent to the Throne of New York & New England. Anba Karas is the official representative of H.H. Pope Tawadros II in North America. After welcoming the new bishops, the Standing Conference settled in for a most productive session, moving forward with the work of the its charitable arm, The League of Oriental Orthodox Churches (http://www.tlooc.org/) and its official college campus fellowship, Orthodox Christian Campus Ministries (http://occministries.org/). Additionally, the members of the Conference discussed the results of their recent National Dialogue with the Roman Catholic Church, the possibility of dialogue in the near future with the Eastern Orthodox Assembly of Canonical Bishops, recent developments with the Conference’s website (www.scooch.org), the annual SCOOCH Youth Conference, the organization of national and regional Concelebrated Liturgies, and a number of other issues. This entry was posted in Featured News, News and tagged Oriental Orthodox, Oriental Orthodox Churches, Orthodox Conference, Standing Conference, USA by Orthodoxy Cognate PAGE. Bookmark the permalink. “Malankara Orthodox community (represented on the Standing Conference by H.E. Mor Titus)”???? Can OCP stop writing this kind of crap, please? Titus considers Malankara Orthodox Church as heretic, then how can he represent it? The Malankara Orthodox Church has two dioceses in the USA, yet this supposedly ‘Oriental Orthodox’ Conference continues to avoid their prelates. This is just a puppet of the Syriac Church. Shame on you!